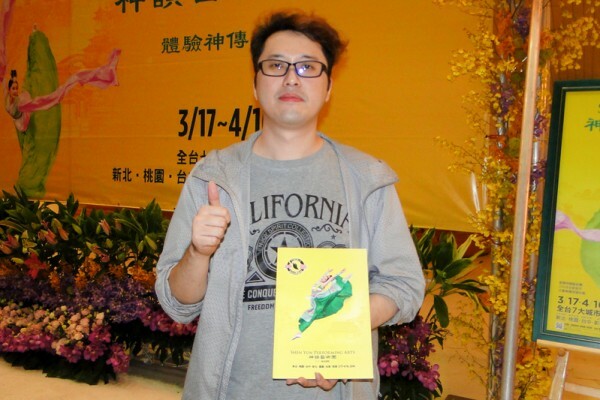 TAICHUNG, Taiwan—Manager of an investment company Mr. Liu Wei-Chi experienced something he never expected as he saw Shen Yun’s show on April 6. “I would have never known how pretty girls look in ancient costumes. The costumes I saw on television were nothing like this. Shen Yun’s designer reconstructed my sense of beauty,” said Mr. Liu. Shen Yun “shattered my definition of beauty and gave it a new meaning. It allowed me to experience real beauty, and this is something I didn’t expect before I came,” he continued. According to Shen Yun’s website, every costume in a Shen Yun performance is presented with brilliant colors, displaying a splendid spectacle—from the Tang Dynasty’s “Raiment of Rainbows and Feathers” to imperial dragon robes, phoenix coronets, and cloud capes; from the civil official’s headdress and robes to the warrior’s helmet and armor; and from the traditional rightward cross-collared Han clothing to the ethnic attire of the Manchurian, Tibetan, Dai, Mongol, and Uyghur ethnic groups. With state-of-the-art graphics technology, Shen Yun’s digital-backdrop team creates vividly animated settings, extending the stage and transporting the audience to a world where heaven and earth are one. Shen Yun also made Mr. Liu realize that Chinese culture is divinely inspired. “All of its stories and messages conveyed divine ideology to us through the form of art. As I stared at the stage, I was in another time-space, immersed in a divine realm,” Mr. Liu said.